The Internet is now one of the most popular media outlets for campaigning and elections, and may soon be used for electronic voting. The scope of this paper is to examine the impact of the Internet on American politics relative to campaigns and elections by conducting the relevant literature review and synthesis. It will attempt to follow the progression of the Internet’s role in politics, and identify both positive and negative impacts. It will assess what the Internet has changed, and conversely, what it has not changed and study the impact of the Internet in terms of candidates, strategists, media, citizens, and activists. 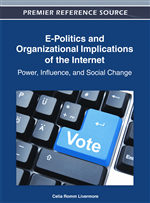 A review of the literature from the period 1999 to the present shows the differing opinions and changing trends in assessing the impact of the Internet on the political process. The literature shows a general correlation between the maturity of the Internet and its impact on the political process. Where the earlier literature takes a more conservative view of the role of the Internet in politics, much of the literature written between 2002-2004 begins to show the growing influence of the Internet in politics. By 2004 and beyond, most literature describes the maturing Internet and the larger role it plays in the American political process.